Looking for a fun activity to do with your dog on a rainy day? 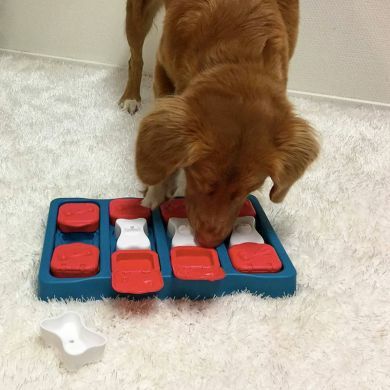 Here's a great interactive game you can play with your canine mates. Dogs require mental stimulation as well as physical to meet their needs. Stimulate your dog's brain and you may find your dog to be more relaxed and confident. This game allows for different levels of difficulty so whether your dog is an Einstein or a Homer Simpson he'll be happily engaged. You can hide treats in the depressions under the sliding discs. Then let your dog look for the hidden goodies by sliding the pieces with his paw or nose. To increase the degree of difficulty you can place the white plastic blocks in the depressions in the middle of the dog Brick. If that's a bit too hard you can tie a string through the holes in the blocks to make it easier for your dog to grab them and pull them out of the way. This is a great activity for you and your dog to play together... especially on those rainy or cold days. On hot days, mix some dog food with water and pour some of the mixture in the hollows. 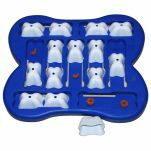 Then place the game in the freezer to set it. Perfect for hot days or when your dog needs some extra activity. Do not let the dog chew or bite the toy, only play with it together with your dog, do not leave the dog unattended, the dog must not play with or chew the blocks. Put away when the game is over. Designed for dogs, it is not a toy for a child. Suits dogs of all ages and sizes. I was very impressed when I received this product. It is quite large and easy to use. Our Aussie Bulldog Chucky just loves it. 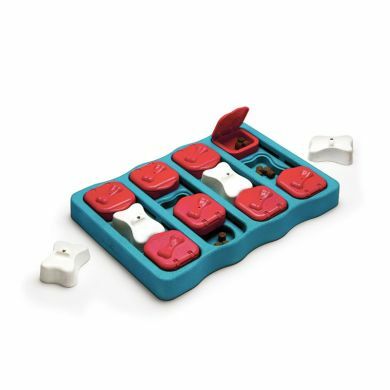 The additional 'bone' blocks are great to mix it up and keep him entertained. Best of all it is very easy to keep it clean. 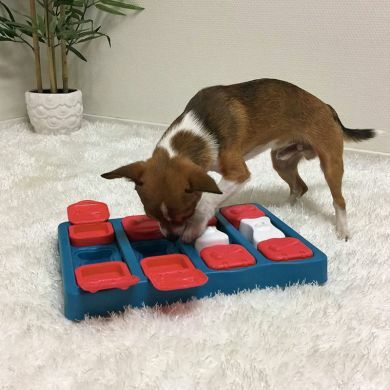 Read 6 customer reviews of Nina Ottosson Dog Brick Game. The average customer rating is 4.3. Great design but as another review says pretty simple, my Australian sheperd had it empty and flipped over looking for more after about 2 mins so not a boredom buster... More time loading the treats in than him getting them out. Aweosme delivery thanks. Our dog is a border terrier so it doesn't take her long to rip through anything - it does slow her down though and makes her think about her food before inhaling it! I'm very happy with the brick game I bought for my pug Delia. It's of good design and easy to clean. The hollows for the treats are nice and shallow and make it easy for a flat-faced breed to get the treat. She needs to be supervised when using it though as she tries to claw the darker brown pieces up rather than sliding with her paw. It's a good fun game for rainy days when walks are not possible. It was sent very fast with wonderful service as usual from Waggle. I bought this for my 2.5yr old Lab - he worked it out in about 2mins flat ... so I was slightly disappointed it wasn’t as much of a boredom breaker as I would have hoped. Great design and concept though! Great toy for your Dog! Keeps them busy for a while and its fun watching them work it out!